Pundits agree that the Age of Man is not long for this world. The Age of Cephalopod is only years, if not months, from its commencement as has been witnessed by the wave of humboldt squid attacks upon San Diego. As the seas rise, and the tentacles of Earth’s future overlords stretch out from the murky depths of the ocean to grasp the land, as they claim the throne for which they have long longed, cephalopods may crush humanity or they may enslave it. This is a question that cannot yet be answered. But what will be the game-changing event that could shake off the tentacled grasp of our future squid overlords? What next should we fear irrationally? More importantly what next should we irrationally exube? Before humans ruled the world, by harnessing the powers of the flame and the automobile, before the continents were non-contiguous, before dinosaurs ran around with their funny little arms, the dominant life form was the kangaroo. It had the run of the land, hopping where it pleased, grazing where it sought fit. Any creature that stood in the kangaroo’s way was boxed into obedience and punished in their notorious courts. Scientists indicate this went on for millions of years, a global Kangaroo Kingdom of sorts. Have you ever stopped to consider why this is no longer the case? Why is the mighty kangaroo only found on a single sparsely populated island continent, a home to former brigands and current obesities? What allowed their long tenure of dominance? And what destroyed them? Was it the walrus? It was the kangaroo’s marsupial pouch that allowed them to dominate the globe, their greatest bio-technological development. And their civilization began to collapse the day they eschewed their own pouches for baby carriages. 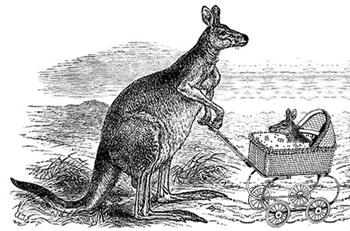 Their misguided adoption of increasingly beastly baby carriages led to the Fall of Kangaroo. Suppose for just one minute that the true future overlords of Earth do not lurk 20,000 leagues below, but instead lurk in our own households, on our own streets, suckling at the teat of our womanfolk and joyriding in their personal transports? This is the lesson of the kangaroo. In this special five part exposé, we examine the evolution of the modern baby carriage and the implications that evolution has for your portfolio. JD, whatever you’re on, I want some.